Bad boy Jonas Wyatt knows it is fate that Rachel becomes his mate. He can sense it. He can also sense her reluctance. But she has little power over the mating heat of the Breeds. It is Jonas's destiny to claim her. And nothing will stop him from having his way. The third entry in Nalini Singh's Psy/Changeling series finds Brenna, a she-wolf Psy, turning to Judd, a telekinetic and Council defector, for help—but the passion between them could push them both over the edge of sanity. 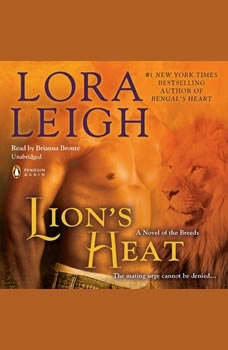 In the latest novel in the Pride series, Bo Novikov, a smooth-talking, irresistibly attractive shifter, sets out to convince stubborn Blayne Thorpe of how good they can be together. Contains mature themes. Unabridged, 9 hoursRead by Brianna BronteThe Breed guaranteed Micah no harm would come to her, but they never allowed for her sensual fascination with Navarro, or his unstoppable need to claim her as his mate, in both body and soul. I didn't finish this book. I've loved this series, but the last few books have been boring. I think I'm done with it.